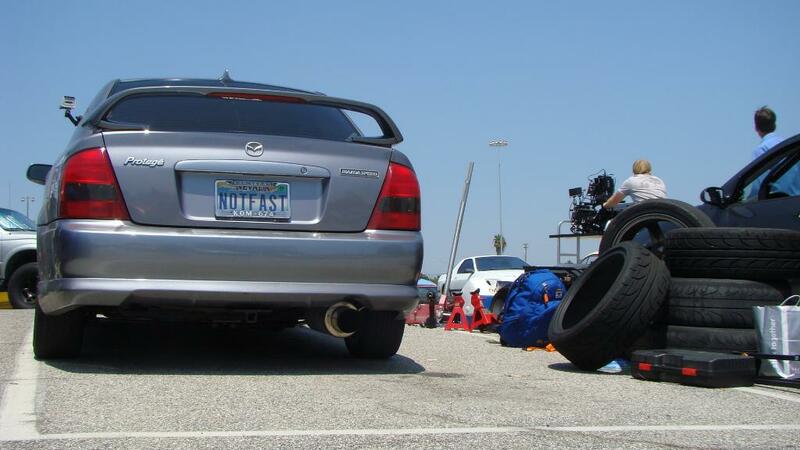 It’s one thing to watch Fast and Furious; it’s another thing entirely to get out there in your Mazdaspeed Protege, home built Caterham replica or even Corvette (though US made cars are sniffed at amongst this crew) and try to drift on your own. 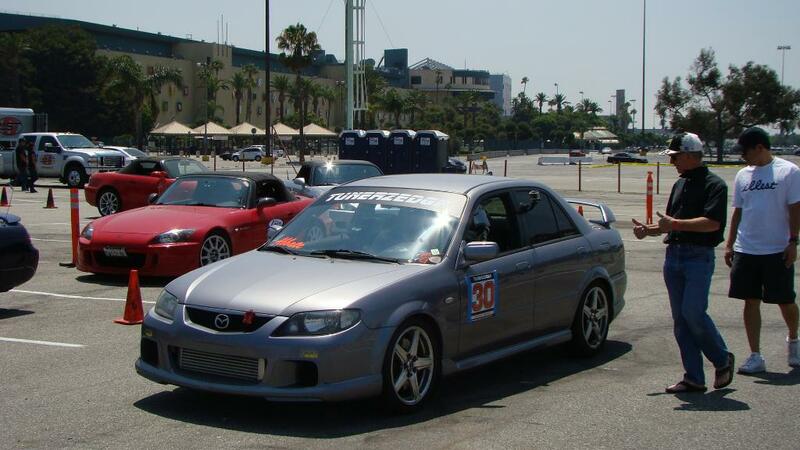 But the threat of being exposed as well-intentioned, but lacking mad-skills; painfully average, or worse, a straight up jackass did not stop people from showing up at the Gymkhana Grid Series event at Hollywood Park on Sunday. The event, produced by Grid Series founder Chris Willard gave regular (some of whom were delusional) folk, skilled amateurs, pros, and super-duper pros, like Ken Block — who was in da house showing off his new Ford Fiesta Gymkhana special (not sniffed at because a) it’s basically British, and b) uh, Ken Block’s driving it) — the opportunity to make Gymkhana be the super-trendy thing that the adrenaline junkies talk about for the next five minutes. 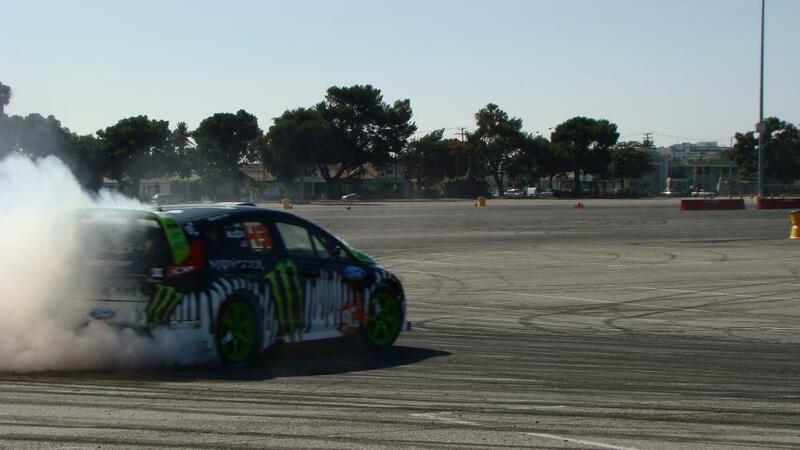 Or, depending how the post-event buzz goes, it could make people super-psyched that Ken Block is hosting a Gymkhana invitational Dec 3-4 in Irwindale, and give autocross’ more fun and complicated cousin, a little more lasting power. 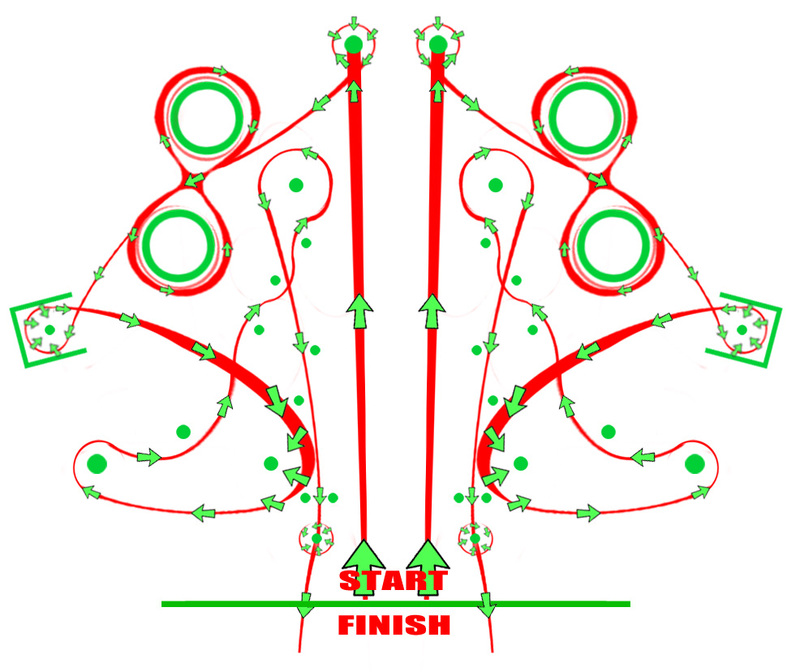 With the objective of Gymkhana being to finish the course (a course which is best served memorized!) 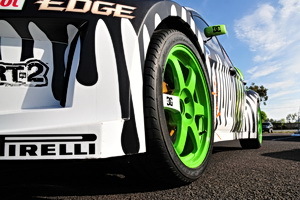 with the fastest time, drivers make their way around cones by performing 360 degree spins, among other moves, and yes, drifting. At today’s event, there were two mirror image courses (except that one was slightly bumpier than the other), and the 95 or so drivers lined up to take one or the other, offering a tacit pass to the more skilled drivers to go out several times. It’s like high-school, but you don’t get a wedgie if you cut in line. 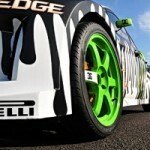 What is most shocking is that Ken Block finished first in 54 seconds, except for the part about that being shocking. Coming in second, at 57 seconds, was super-fast drifter, Alex Pfeiffer, the fella in that home built Caterham I mentioned before (aka Lotus 7, aka a million other names) who liked to refer to his car as his “beer runner. Sad to learn that “beer runner” was already in use as a personalized license plate, the second place winner got a suggestion from an adoring racing fan that was so jaw-dropping that it restored my faith in, well, nothing, because he suggested that one “e” be changed to “a”. The ones with heads did, in fact, catch some cool drifting, especially when Block was driving, but they also caught a lot of jackasses forced to confront their own mediocrity after maneuvering the obstacles by going the wrong way. 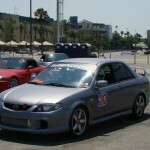 All in all, the event allowed skilled autocross drivers to try their hand at something new, and regular folks to chase their dreams, but the frequent visits from track officials made me think of the U2 “Streets Have No Name” video where the band is performing on a downtown LA roof as the cops are trying to shut them down. I guess the one difference is that Bono can probably spell beer. I’ve seen enough Spec Miatas at the track and I totally missed this one. Thanks for catching the error. I corrected the photo caption for the S2000. 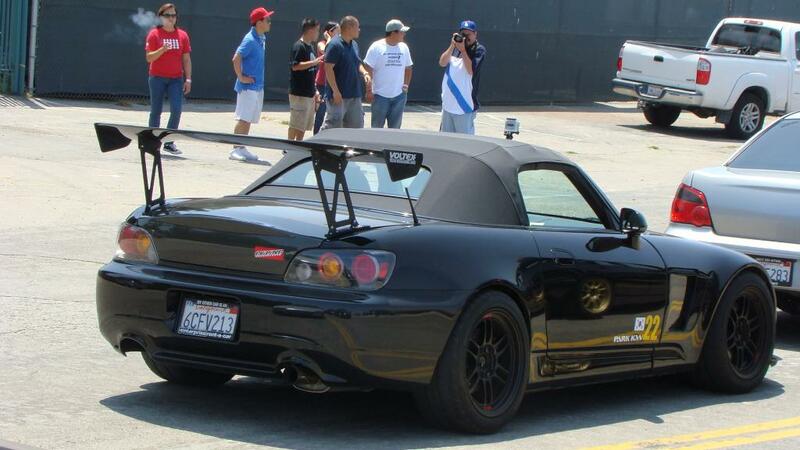 That black car is not a miata, its an S2000. @Phil – No personal attack on Alex Pfeiffer was intended. Although, there were other drivers who entered the competition who didn’t have the mad skilz Pfeiffer possesses and probably overcome with enthusiasm after playing Tokyo Drift for too many hours. 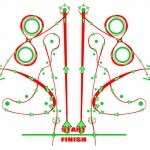 This first race was intended to test the market and level of interest to find out if this race series has a future. You are welcome to continue reporting race results if you want to keep us informed. The guy in the Caterham type thing was Alex Pfeiffer.. look him up, he knows a couple of things about drifting. Lot of name-calling in your article there. What was your time on the course?